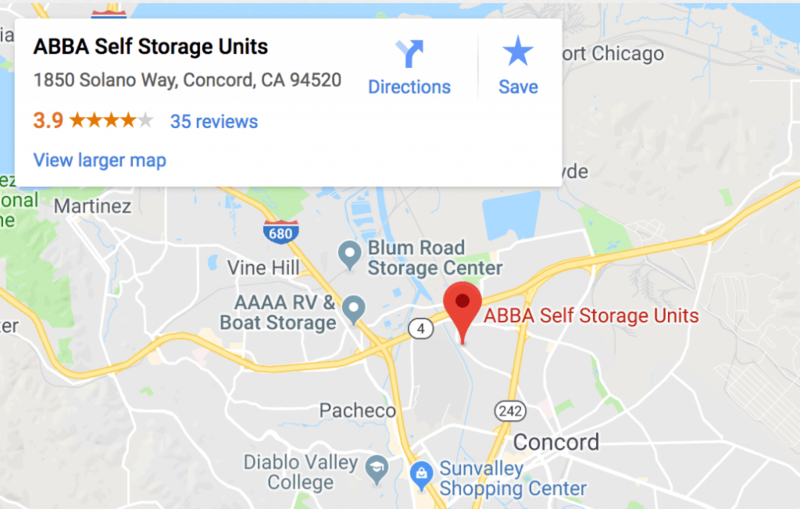 Abba Self Storage Units is conveniently located in Concord to serve the surrounding communities including Walnut Creek, Martinez, Pacheco, and the East Bay area. We guarantee you will be impressed with our high-tech security and cleanliness, and will find our terms flexible as well as reasonable. Our storage facilities offer contractors and small businesses a great alternative to expensive warehousing. With some of the largest storage units in the East Bay many of our clients utilize our storage units to store anything from machinery and materials, to equipment and old office records. 5′ x 5′ Small furniture; a chest of drawers, several boxes and small items etc. 5′ x 10′ A Couch, Chair, chest of drawers, mattress set, boxes and small items etc. 10′ x 10′ Standard furnishing from a one bedroom apartment with refrigerator or washer and dryer, plus boxes and small items etc. 12’6″ x 10′ Standard furnishing from a one bedroom apartment with refrigerator or washer and dryer, plus boxes and small items etc. 10′ x 15′ Furnishings from a two bedroom apartment or small house, plus cartons and small items etc. 12’6″ x 15′ Standard furnishing from a one bedroom apartment with refrigerator or washer and dryer, plus boxes and small items etc. 10′ x 20′ Furnishings from a small house or two bedroom apartment with major appliances, many boxes and extras or hold a car or truck etc. 12’6″ x 20′ Furnishings from a small house or two bedroom apartment with major appliances, many boxes and extras or hold a car or truck etc. 10’6″ x 35′ Furnishings from a small house or two bedroom apartment with major appliances, many boxes and extras or a car etc. 12’8″ x 35′ Furnishings from a small house or two bedroom apartment with major appliances, many boxes and extras or hold a car or truck etc. 15′ x 35′ Furnishings from a five or six bedroom house with major appliances or hold two cars, trucks or boats. Will hold contents of a 40 foot moving van etc. As you can see from our descriptions of interior and exterior unit sizes, Abba can accommodate whatever it is you want to store. Our wide selection of sizes and different types of storage allows you to find the best fit. We even give you packing tips to help you maximize your space. Customer service is important to us so we have a 14’ truck available to help make your move-in easier. We welcome our neighbors from the surrounding East Bay communities to take a look at all of our amenities. We can provide customers in Concord, Pleasant Hill, and Pacheco mini storage units, larger sized units suitable for contractors that need more space, a house full of furniture, or boat and RV storage. All first floor storage units for easy access. Each unit equipped with its own alarm and sprinkler system to protect your belongings. Well-lit, extra wide hallways in all our interior units. All buildings are color-coded to assist with quick identification and finding your way around. Air-cooled spaces in a variety of sizes for storing valuables such as antiques and artwork. State-of-the-art technology monitoring the facility at all times. 300 secure concrete paved RV, boat, and vehicle storage spaces in two different sizes. Highly secure storage perfect for important records and documents. Air-cooled spaces in a variety of sizes. Large exterior storage for contractors, landscapers, and suppliers to store equipment or additional inventory. Larger size units provide a preferred alternative to warehouse storage. For further information or directions to Abba, please call (925) 969-9222, or contact us at manager@abbastorage.com. We make customer satisfaction our highest priority. Also remember that you can reserve a storage unit or manage your account online with us. Abba Self Storage Units, in Concord, CA, is ready to serve your needs whether it is for large or mini storage units, more space for your business to grow, or boat and RV storage. We take pride in providing secure, clean facilities for the East Bay area as well as conveniently meeting the demand for more Pacheco mini storage units.